Ringwood Motel is located 25kms east of Melbourne CBD, just off Eastlink, on the Maroondah Highway, Ringwood, and is also located within close proximity to the business areas in the outer eastern suburbs of Bayswater, Croydon, Knox, Mitcham, Nunawading, Chirnside Park, Lilydale, Scoresby, Wantirna, Vermont, Kilsyth, Montrose and Boronia. You may prefer to relax and enjoy a trip around the nearby tourist attractions of the Yarra Valley and Dandenong Ranges. Ringwood Rail Station is approximately 3km from the motel, a frequent train service operates to Melbourne – approx 35 minutes. Skybus from Airport to Spencer Street Station (Melbourne City). Then take a train from Spencer Street Station (Melbourne City) to Ringwood Station. Then a taxi from Ringwood Station to Motel (approx 3km). Airport Shuttle Bus must be pre-booked. Contact +61 (3) 9729 7622 or www.airportbus.com.au for more information. Take Tullamarine Freeway (route 79) towards Melbourne (Toll road after Bell Street exit. Citylink Phone No. 13 26 29 to obtain a day/week pass or obtain from Car Rental Company). Turn left into Brunswick Road. Turn right into Lygon Street. Turn Left into Princes Street (route 83). Proceed onto Eastern Freeway, (Eastlink) – (route 83). 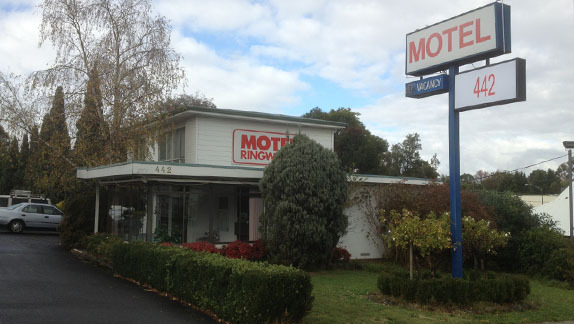 Ringwood Motel is at 442 Maroondah Hwy, right just past Kalinda Street. Turn left at Maroondah Hwy sign - stay in left hand lane. Ringwood Motel is on the right, you need to drive past motel and do "U" turn at next set of lights and turn into Service Rd. Cross over Oban Road intersection and just prior to Mt Dandenong Road intersection Ringwood Motel is on the left hand side of the highway. Do a U-turn at Kallay Street traffic Lights, then turn into Service Road. From Princess Highway turn right on to the South Eastern Freeway. Turn off Freeway at Stud Road (route 9) turn right and go over Wellington Road (route 18), Ferntree Gully Road (route 22) and Burwood Highway (route 26). At Boronia Road (Route 36 & 9) turn left. Cross over Mountain Highway (route 28). Turn right into Wantima Road (route 9). Cross over Canterbury Road (route 32). At Maroondah Highway (Route 34) turn left. Cross over Mt Dandenong Road (route 22). Copyright 2014 © Ringwood Motel. All rights reserved.